The concept behind portable pressure washers is simple: they use a tank of water, and reasonably powerful pump, to give you a decent period of bike-washing without a water source. The Aqua2Go Pro is the top of the range portable washer from the Dutch brand, and it provides you with portable washing, as well as quite a bit more! 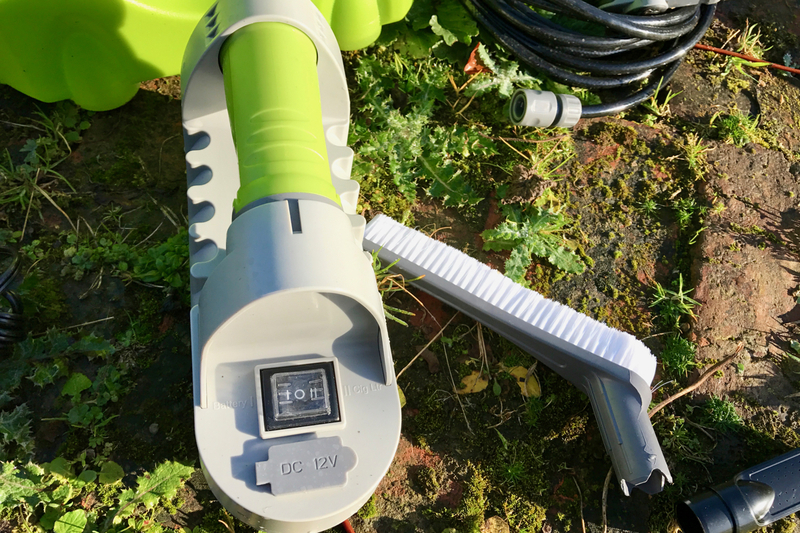 The Aqua2Go Pro provides two options for washing: The first is to use the integrated 20 litre water tank, which will provide you with 30 minutes of washing. 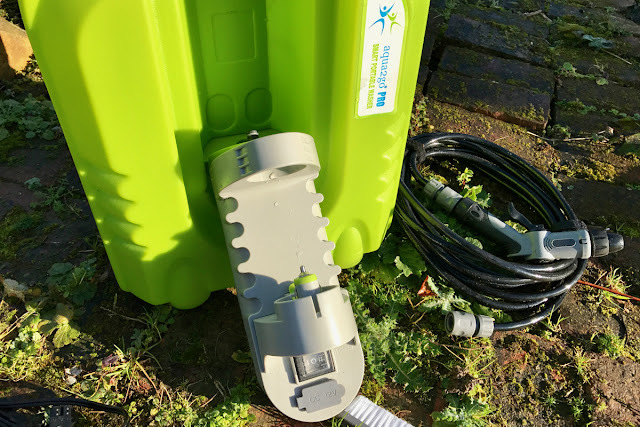 The second is to detach the pump unit, and use it as an in-line pump with another water source (such as a stream or large bucket); this could potentially extend your wash-time significantly. This two-option capacity is a useful feature, as it means you don't necessarily have to take the bulky water tank with you, if you know there will be buckets or water sources around at the venue you're travelling to. In terms of output, the flow-rate of the Aqua2Go Pro is towards the lower end of the 'pressure washer' spectrum; delivering a water stream that is similar to a spray nozzle on a mains-fed hose with medium water pressure. The pressure is easily enough for bike washing though, and in fact a full-powered pressure washer isn't advisable for bike washing, as you risk blasting out all the useful grease from bearings. To help with washing, you get a spray nozzle, a shower head, and a brush head. This is a good assortment for bike cleaning, and as long as you only use the brush for frame cleaning, it should stay in decent condition. The spray nozzle has adjustable flow, to make it either a pin-point jet, or wider spray. 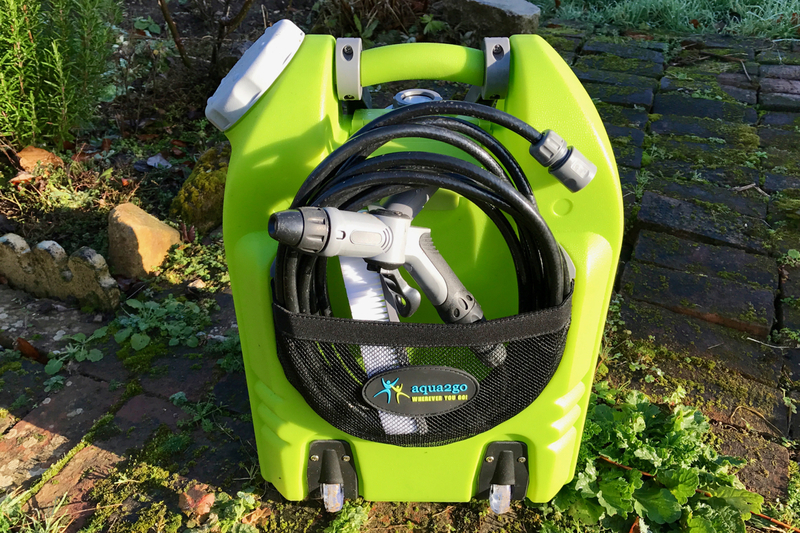 For bike washing, the Aqua2Go Pro is a robust and useful unit. 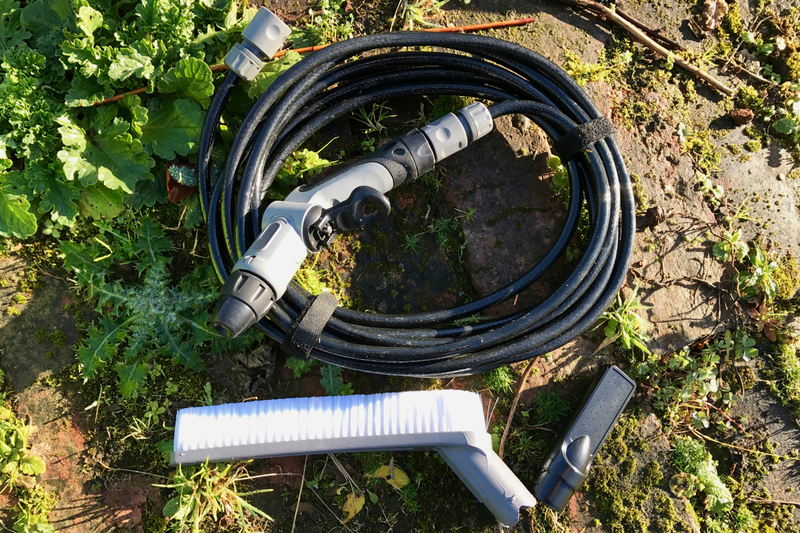 The dual water source potential, decent water pressure, assortment of nozzles, and good length hose, make it ideal for washing off mud, road grime and brake residue. It's by no means as powerful as a mains-powered pressure washer; but then you don't really want that for bike cleaning anyway. 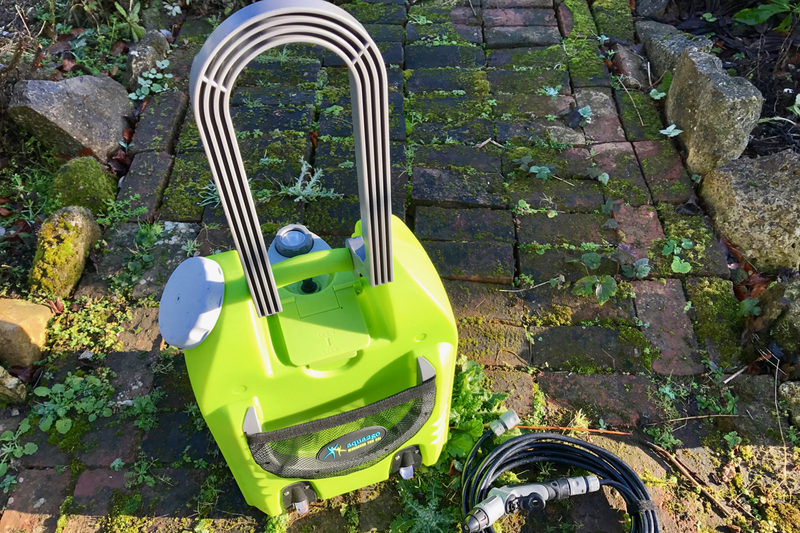 As well as its washing capabilities, the Aqua2Go Pro Pressure Washer also has some neat and potentially very useful secondary features. 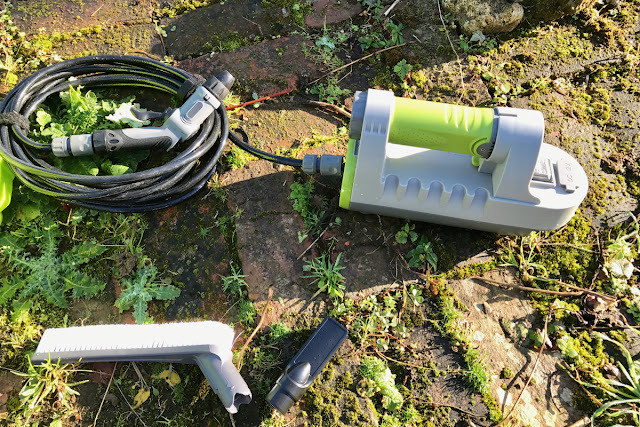 The first of these is that the power source can either be the integrated battery, or a 12 volt outlet in a vehicle; providing you with added versatility and life. 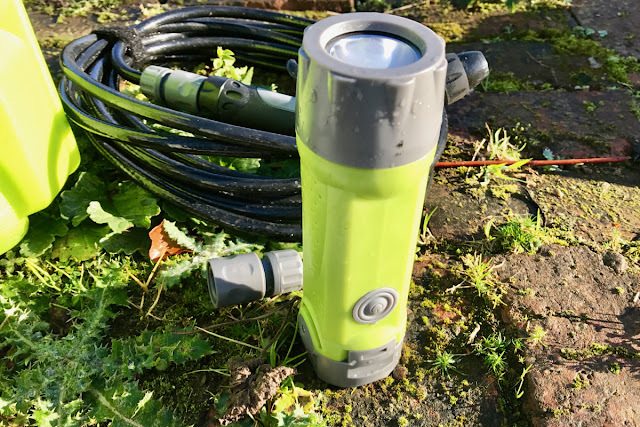 The second, is that the integrated battery can be detached, and used either as a power-bank for charging devices, or as a torch (very useful at 24 hour races)! The third noteworthy added feature, is that the battery itself can either be charged from a mains charger, or through a car cigarette 12 volt output; providing you with the ability to recharge the unit, even when you're in the back-of-beyond. Neat features, which demonstrate thought has gone into the design of the Aqua2Go Pro washer. From the wheels, to the battery pack and spray nozzles; the Aqua2Go Pro has an impressive build quality, and performance. 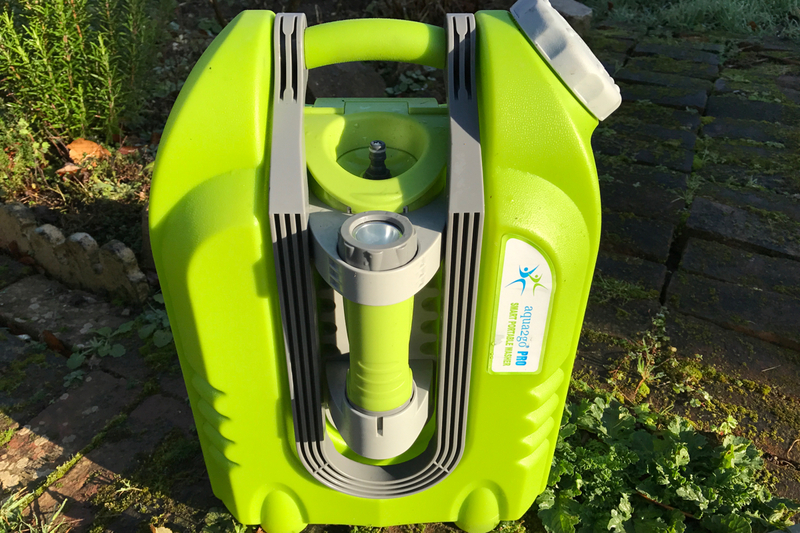 It provides you with portable, easy to use water source; with a decent water pressure for bike washing. The collection of nozzles and brushes makes it useful for a variety of jobs; while the versatile battery pack and pump, will enable you to use the unit in a number of different formats. Overall, a potentially invaluable addition to your race kit, and/or home garage.